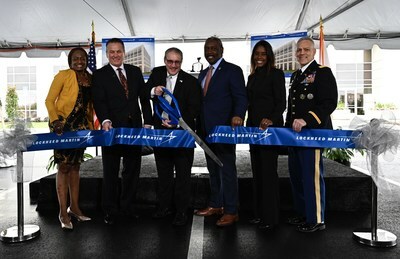 ORLANDO, Fla., Feb. 13, 2019 /PRNewswire/ -- Today Lockheed Martin (NYSE: LMT) announced the opening of its $50 million, 255,000 square foot Research & Development II facility in Orlando, Fla.
"I am proud to recognize Lockheed Martin's continued investment in our community through the expansion of its new research and development building and the hundreds of new high-wage jobs the company is creating," said Jerry L. Demings, Orange County Mayor. "Lockheed Martin and other businesses help drive innovation and opportunities across Orange County and worldwide." "Orlando is known for its skilled workforce and strong economic climate, thanks in large part to the foundation laid by Lockheed Martin's location to Central Florida more than 60 years ago," said Orlando Mayor Buddy Dyer. "This announcement demonstrates Lockheed Martin's continued commitment to our residents, their families and our Armed Forces by providing high-paying jobs and a state-of-the-art facility that will develop some of the most advanced technology in the industry right here in Orlando." Additionally, Lockheed Martin Executive Vice President Frank St. John said, "The Research & Development II facility expands our robust Florida presence and fosters significant opportunities for collaboration and innovation among our employees. We will continue our strong partnerships with local and state governments, community partners and area universities to grow our business, our workforce and the critical capabilities we provide to customers worldwide." Lockheed Martin officially broke ground for the six-story building on Feb. 14, 2018, with an aggressive goal of completing it in a year. Employees in the building will support engineering, program management and business operations for Lockheed Martin Missiles and Fire Control's Orlando site. Lockheed Martin's Orlando operations include both Missiles and Fire Control and Rotary and Mission Systems divisions. Across Florida, Lockheed Martin operations support an estimated 40,000 direct, indirect and induced jobs, with work spanning 1,300 Florida businesses and suppliers.